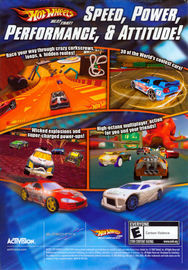 Developed by Eutechnyx, and published by Activision, Hot Wheels Beat That! was released in 2007 under the PS2, Xbox 360, Nintendo Wii, Nintendo DS, and Microsoft Windows platforms. Everything listed below makes an in-game appearance. Each version's vehicle selection/decoration may vary (example: Carbide is only found in the DS version).